TOKYO – Toyota's operating profit soared 54 percent in the latest quarter as cost cutting and gains from favorable foreign exchange rates helped offset lackluster sales. A onetime windfall from lowered U.S. tax liabilities, courtesy of the recent tax cuts, also chipped in 291.9 billion yen ($2.59 billion) that helped Toyota nearly double its net income. The robust results prompted Japan’s biggest automaker to lift, for a third time, its earnings forecast and target record net income for the current fiscal year ending March 31, 2018. Operating profit soared 54 percent to 673.6 billion yen ($5.98 billion) in the carmaker’s fiscal third quarter ended Dec. 31. Net income nearly soared 94 percent to 941.8 billion yen ($8.36 billion), the company said in its Feb. 6 earnings announcement. The U.S. tax breaks, which reduced the corporate rate to 21 percent from 33 percent, took effect on Jan. 1. 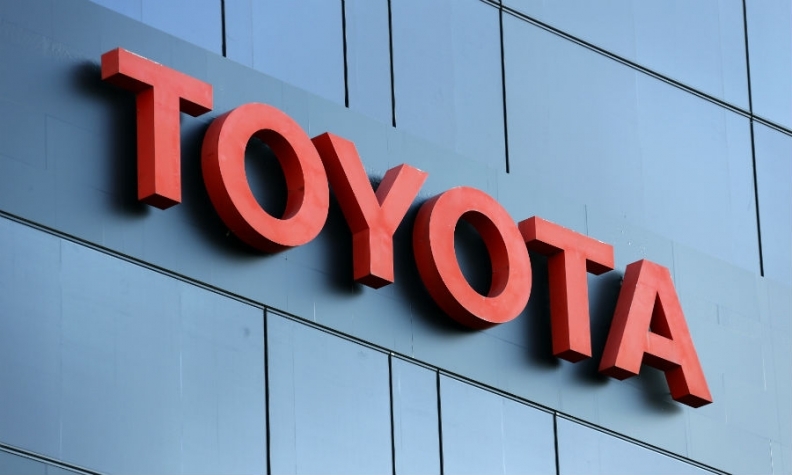 But Toyota booked the impact in the company’s fiscal third quarter ended Dec. 31, accounting for a revaluation of deferred tax assets and liabilities on its U.S. operations. Revenue increased 7.4 percent to 7.61 trillion yen ($67.55 billion). Global retail sales dipped 0.5 percent to 2.63 million vehicles in the October-December period, including results from its Daihatsu small-car subsidiary and truck-making affiliate Hino. Worldwide wholesale volume edged ahead 0.4 percent to 2.29 million. Foreign exchange rate gains boosted Toyota’s third-quarter earnings. The Japanese yen’s decline against the U.S. dollar, euro and other currencies pumped up quarterly operating profit by 195.0 billion yen ($1.73 billion). Cost cutting added another 35 billion yen ($310.7 million). But underlying business was sapped by weakening performance in North America, Toyota’s traditional cash cow and biggest market. North American operating profit plunged by more than half to 33.1 billion yen ($293.8 million) in the October-December period. Regional wholesale volume in North America shrank 1.3 percent to 735,000 vehicles in the fiscal third quarter, but North America kept its position as Toyota’s biggest market. In the U.S., Toyota has been struggling with a flood of vehicles coming off lease, rising incentives and a rush of consumers away from passenger cars toward to crossovers, SUVs and pickups. Declining North American production, as Toyota rolled out a full-model change of its Camry sedan, also took a bite out of regional operating profit. Toyota has been slow in reacting to the U.S. shift to light trucks. Industrywide, cars made up just 35 percent of total U.S. sales in 2017. But at Toyota Motor Sales U.S.A., which covers sales of both the Toyota and Lexus brands, cars accounted for 42 percent of the mix. Toyota has been trying to rein in incentive spending, improve its management of leasing and pump up output of crossovers and pickups to bolster profitability. Lower spiffs on some nameplates, such as the just-redesigned Camry sedan, are helping Toyota control incentive spending. Toyota’s outlays were lower than the industry average, which rose 9 percent to $3,672 per vehicle in 2017. But Toyota Motor Sales’ spending rose more sharply, climbing 11 percent to $2,367 per vehicle in 2017, according to data from Motor Intelligence Corp.
European operating profit grew 29 percent to 23.3 billion yen ($206.8 million). European wholesale shipments increased 1.7 percent to 237,000 units in the three months. Toyota is coming off a previous fiscal year in which full-year net and operating profits both tumbled. That reversal cut short a run in which Toyota had notched two-straight years of across-the-board records in full-year revenue, net income and operating profit. President Akio Toyoda warned last May that his company was headed for a second year of falling profit and ordered massive cost controls to prevent that from happening. Thanks to aggressive cost cutting and better-than-anticipated foreign exchange rates, Toyota is now predicting profit to modestly increase, rather than decline. In announcing results, Toyota upgraded its fiscal year outlook for a third time. Its updated net income target, if achieve, would mark a new all-time high profit. Toyota now expects operating profit to rise to 2.20 trillion yen ($19.53 billion) in the current fiscal year, from 1.99 trillion yen ($17.67 billion) a year earlier. Net income is seen advancing to a record 2.40 trillion yen ($21.30 billion) from 1.83 trillion yen ($16.25 billion) the year before. Aggressive cost cutting and lower quality-related outlays will also help. Toyota, however, kept its full fiscal year sales target unchanged. It expects wholesale volume to drop just a hair to 8.95 million vehicles, from 8.97 million the year before. Retail sales are seen expanding to 10.3 million vehicles, from 10.25 million.